Call me biased, but when it comes to Easter, there's one country that really knows how to celebrate it, and that's Greece. It's not only a religious holiday, but also a religious festival, a party even. People celebrate the resurrection of Christ and with it the rebirth of spring; this is done with singing, dancing, eating delicious foods, and drinking extraordinary wine, all day long. Easter is the one of the most significant religious holidays in the Greek Orthodox calendar. So much so, that everything comes to a complete standstill. People abandon the city and go to their village or island, and big cities like Athens become a ghost town. During this great escape, lambs are being prepared for the spit, eggs are dyed red, and the sweet smell of "tsourekia" (sweet breads) and "avgokouloura" (egg cookies) baking in the oven tickle your olfactory department at an almost menacing level. And thus, all these preparations are for one Easter Sunday. Wherever you go to Greece around Easter time, you will find the sweet scented tsoureki being baked and sold everywhere. Bakeries, pastry shops, and even super markets supply them. 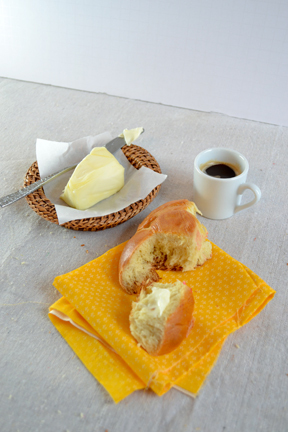 Tsoureki (pronounced tsoo-REH-kee) is a brioche style bread enriched with sugar and butter. It is traditionally home-baked on the Thursday before Easter Sunday. 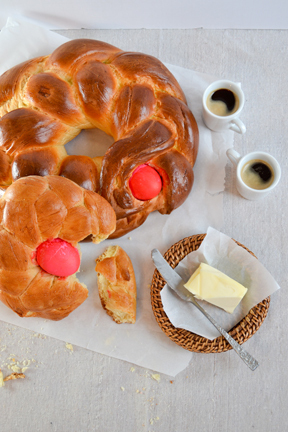 Embellished with red eggs, tsoureki is given as a gift to family and friends, a sort of gift or blessing for the festive season. The most popular flavoring for tsoureki is "mahlepi," even though cardamom and mastic are sometimes used. Mahlepi comes from grinding the seeds of the European cherry Prunus Mahaleb. It is such an aromatic spice that a small amount goes a long way. For the Greeks, Mahlepi is not just a spice with a slightly floral flavor, but a spice that evokes a nostalgic warm aroma of evoking thoughts of Easter. A good tsoureki should be soft, moist and fluffy, yet stringy and chewy. It should have a light crumb; yet, it should be luxurious in taste and smell. If anything, it should be slightly under baked rather than over baked. It is considered a perfect snack to munch on after the midnight Church service on Easter Saturday. In a way, it eases Greeks into the Easter Sunday’s feast of lemon-garlic-roasted potatoes, spanakopita (spinach pie with filo), tsatsiki (yogurt dill dip) and roasted lamb on the spit, especially after many weeks of lent. 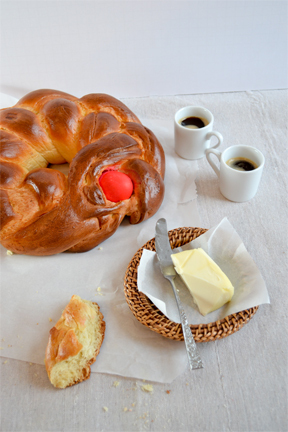 The shape of choice for the tsoureki is usually a pleated loaf or wreath; the wreath is the most common shape. The reason for pleated is not only for aesthetic reasons, but also because pleats create segments, so when served, the tsoureki can easily be pulled apart into pieces; therefore, slicing is not necessary. 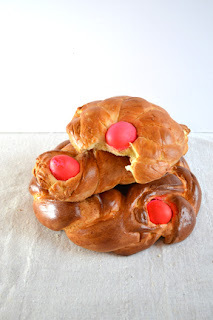 In addition, the ring shape, like the red eggs that embellish it, relates to Easter’s theme of renewal, making the bread ideal for breaking the long Lenten fast. Even though Greeks are known to carry on traditions and customs, it is not for this reason that the tsoureki has endured generations and continents. I would say, with out a doubt, that it’s all in the taste. 1. Place the yeast with the milk and a large pinch of sugar until and leave it till it starts to bubble. Sift the flour and salt into a large mixing bowl then stir in the mahlpi, mastic, and orange zest, if using. 2. Melt butter with sugar till the sugar is melted. 3. Add the melted butter mixture to the flour, and then the yeast mixture. Start to knead the dough vigorously for 8-10 minutes, either in a machine with a dough hook, or by hand on a lightly floured surface. The dough is ready when it feels soft, springy and smooth and leaves a thumbprint when pressed. 4. Shape the dough into a ball and place in a lightly oiled bowl. Cover with a clean, damp cloth or lightly oiled clingfilm and leave to rise until doubled in size (this will take about 1 hour). 5. Knock back the dough on a clean surface by punching the air out and kneading for 1 minute. Divide the dough into 3 equal pieces then roll each piece into sausages, about 40cm long for a large loaf. (Divide into 6 pieces and roll into 25cm lengths, if making 2 small loaves.) Loosely plait the dough, tucking the ends under to secure. 6. Lift the plaited loaf onto a lightly greased baking sheet, cover with a damp cloth or oiled clingfilm then leave to rise for about 11/2 to 2 hours or until doubled in size. 7. 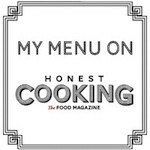 Heat oven to 350 F, 180C/Fan, 160C/ Gas 4. Brush the loaf with the beaten egg. Bake for 25-30 minutes until the loaf is golden brown and sounds hollow when tapped underneath. Cool on a rack before slicing. Easter Note: If making the loaves for Easter, tuck one or more dyed red eggs into the loaves before brushing with egg and baking.